A new double degree undergraduate programme in business administration jointly offered by the School of Business of the Hong Kong Baptist University (HKBU) and the Beedie School of Business of Simon Fraser University (SFU) will allow students access to business expertise from the East and the West, and prepare them for success in the global business environment. The first cohort, comprising a select number of outstanding BBA students from HKBU will start the programme at SFU in September 2019. 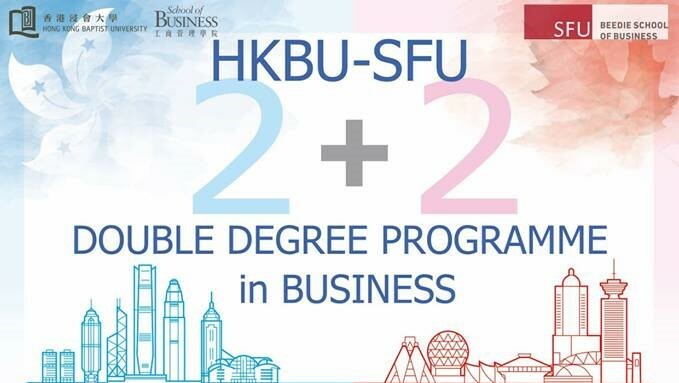 The 2+2 year HKBU-Simon Fraser University Double Bachelor’s Degree Programme in Business Administration, involving two years at HKBU and two years at SFU, is a joint programme that provides students with cross-cultural learning experiences. Upon completion of the requirements, students will earn two bachelor’s degrees, conferred by HKBU and Simon Fraser University respectively. Graduates from the programme will be equipped with international business knowledge and a global perspective that will prepare them to excel in any endeavours they aspire to. Simon Fraser University is consistently ranked among Canada’s top comprehensive universities in the annual rankings of Canadian universities and named to the Times Higher Education list of 100 world universities under 50. HKBU School of Business was recently ranked as a top 25 Asia Pacific Business School by the Financial Times. Both schools are AACSB and EQUIS accredited. HKBU is named 27 in QS Top 50 Under 50 Rankings 2019.